The episode 5 of The King 2 Hearts starring Ha Ji Won and Lee Seung Gi is staging a scene of South Korean prince Lee Jae Ha (Lee Seung Gi) giving moving speech at World Cup Stadium. 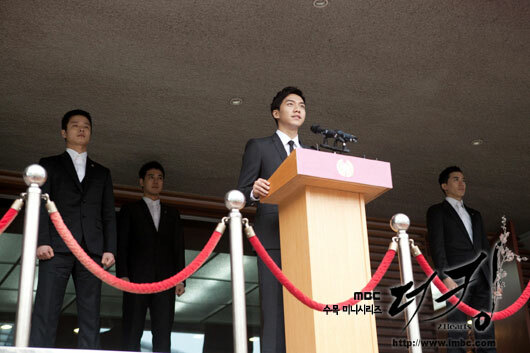 The imposing aura, humorous discourse and body language of Lee Jae Ha who is standing on the podium make people mired in its charm. 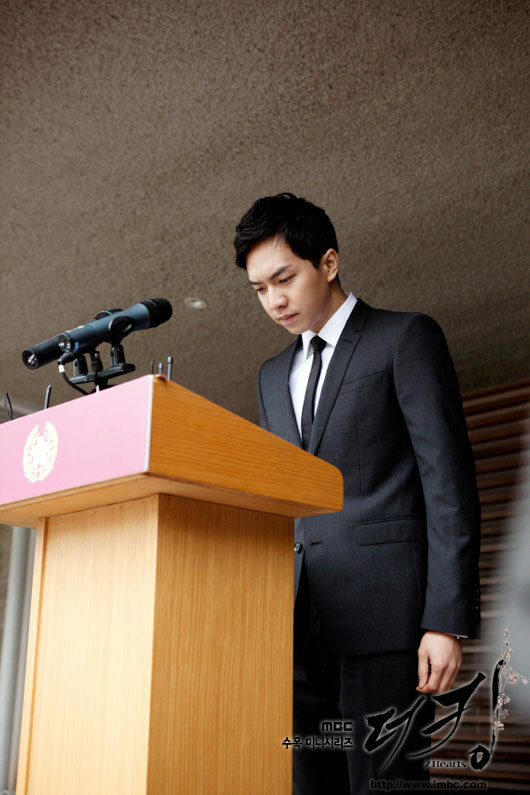 In the episodes broadcast previously, Lee Jae Ha mostly appeared in the look of “ruffian-like,” thus this solemn appearance attracted everyone’s attention. The scene was shot on March 16th, 2012 at Jeonju World Cup Stadium. 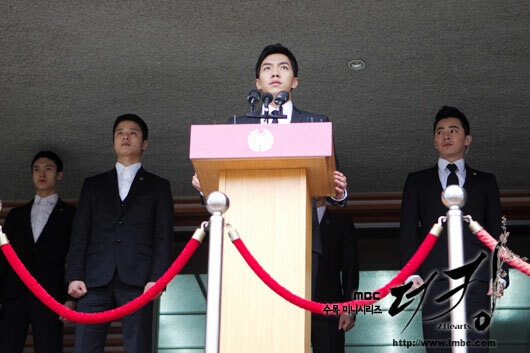 The black suit brought out the slenderness of Lee Seung Gi’s body. More than 300 extras gathered at the vast stadium on the day, and everyone threw their sights on th Lee Seung Gi on the podium. Although he was feeling the pressure, but he suppressed the crowd with strong imposing manner, dominated the atmosphere at the scene. In addition, Lee Seung Gi also showed a sense of humor when resting, making the scene lively. His every actions provoking crew members to laughter. Even if the dialog lines were very long, he could shot it in one take, showing the standard of professional actor. The filmmaker said, "Lee Seung Gi has been active as host since debut, so even if facing the scene of giving speech to the crown, he can play to his strength. 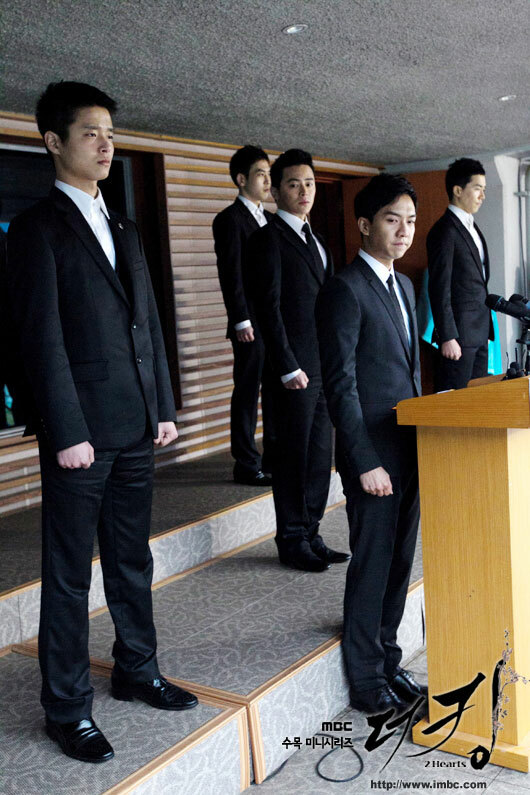 The scene will let audience watches the leadership style of prince which is completely different from previously that exaggerated one's ability. Please stay tuned to episode 5."